Here's the page about Portendo. There has been alot of mystery surrounding it for some reason. I had put up a personal page to show a couple friends, and a large gaming site found it and posted it calling it the "pretendo" and had some other lame crap on it! Anyways, here's the full story. A couple years ago I got a bug up my arse and decided I wanted a portable nintendo; this was after news of the "Top Guy" portable famicom surfaced. 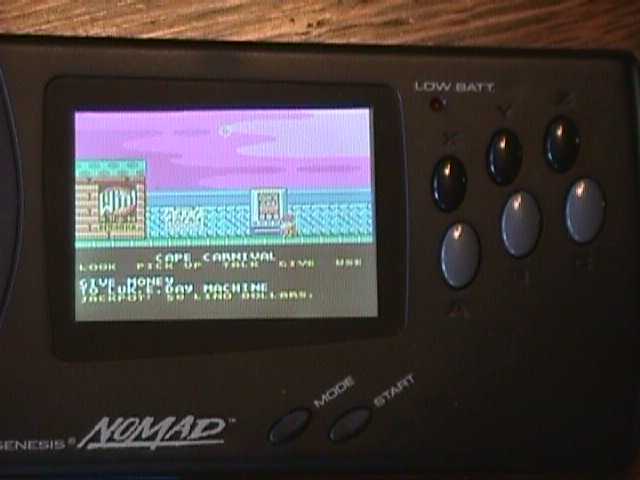 Since only two of those were found and appeared to be hand-made, I knew I could never get my hands on one so I decided to convert a Nomad into an NES. The job was fairly straight-foreward. 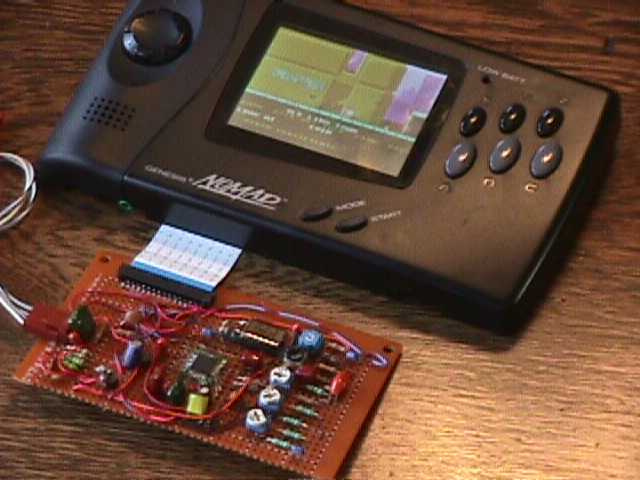 I reverse-engineered the LCD/power supply on the Nomad after getting rid of the Nomad's processor/game board. 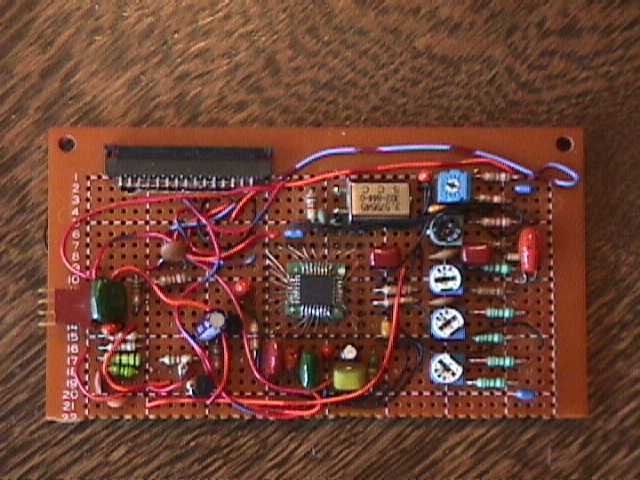 I then made a chroma-decoder which would take the NES' composite signal and turn it into RGB which the LCD required. This is the chroma decoder board. The dials on the right control the hue, tint, saturation, levels, and sharpness of the picture. The black connector connects with the Nomad remains, and the little 4 pin connector has power, audio, and video inputs on it. 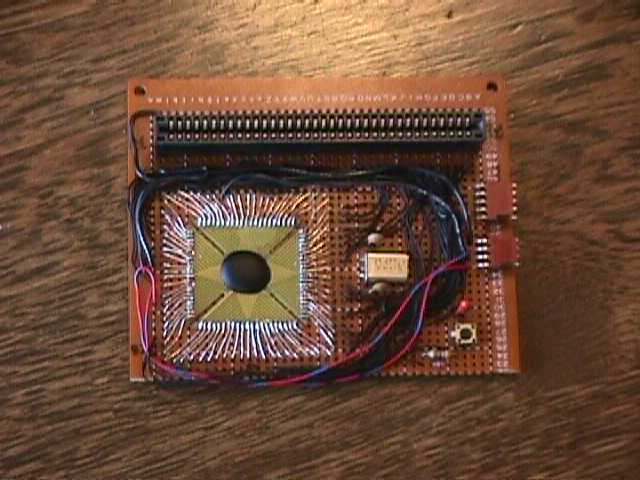 The actual NES board. It contains the single "NES on a chip" which is a complete NES system, condensed down to a single 82 pin chip! Those doods in PirateLand(tm) sure are smart! It is CMOS, so it doesn't draw much juice and it is easy to hook up. Add NES connector, crystal, and some caps and you are done. 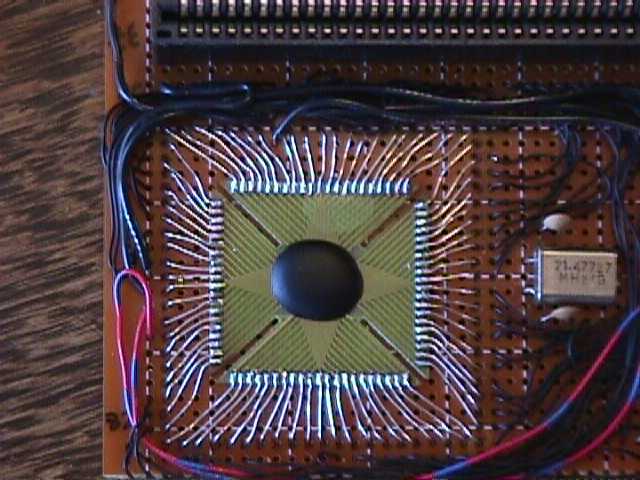 Closeup of the chip. Note how I had to wire it in with 82 very fine wires soldered to it, then poked through the perfboard to hold it in so I could connect my wires to it. Not fun! This is a close-up of the LCD, playing Linus Spacehead, one of my favourite NES games of all times. It is the Aladdan version, as can be seen on the first picture on this page. The LCD looks crystal clear and single-pixel details are clearly visible. This picture does not do it justice. Another view of it, showing the chroma decoder board plugged into the nomad gut. 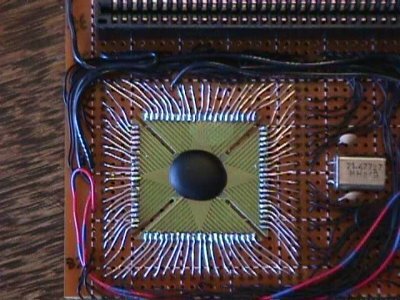 The wires snaking off the picture go to the NES board. 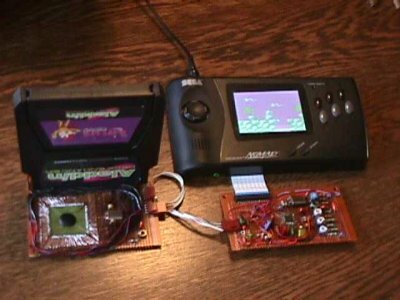 Here is a page about the NES on a chip I used. And finally, some stupid e-mail about this project I've gotten.